Voted #1 Paralegal Services Company! Our commitment is to provide you with the best paralegal services. You can expect us to exceed your expectations every step of the way. We have friendly staff, great prices and great service! Why pay more for routine legal services? *Please contact us for immediate assistance if you can’t find your answer. We’ll be sure to update our website. Software: Our database system automates routine tasks, eliminates the risk of errors, helps us complete your file quickly, and keeps you automatically updated throughout the process. We’ve even set up our database to receive and send text messages. Live Communications: We have old-fashioned values. We do not believe in answering machines. That means you’ll always get a live voice during office hours by a qualified person ready to help you. Live communication is our top priority. Two-person policy: The work of one person is always audited by a second person. This ensures there are no errors with your file. Auditing Deadlines: We work in a team environment so that your file is handled on time every time. We follow strict deadlines. Satisfaction Surveys: We go the extra mile by conducting surveys. Your feedback and suggestions arewelcome. We listen to your needs. Friendly and qualified staff: You will appreciate our family-oriented business. We will make your experience with us as comfortable as possible. we are friendly and non-judgmental. Lots of Experience: We’ve been around a long time. Three senior staff have 35+ years employment with Canadian Legal Resource Centre Inc. and have assisted over 20,000 clients. Check out our staff biographies and meet our friendly and qualified paralegals. A Record Suspension provides proof that a criminal record should no longer reflect upon a person’s character. It is a very important part of the rehabilitation process because it gives people a ‘clean slate’, facilitates integration into the community, and helps reduce the risk of reoffending. A Record Suspension recognizes the fact that people do rehabilitate. Go to the Record Suspension tab and download your free guide. You’ll receive tips and strategies that will save you time and money. In addition, you’ll learn how to reduce the risk of refusal. Would you like to visit some of the most beautiful places in the world which are located in the United States? Snowbird down south? Or, would you like to attend conventions, seminars and meetings in the USA for work? Your criminal record may ban you from entering the United States. A Waiver allows you legal entry to the United States or en-route to other Countries. It reduces the risk of refusal, embarrassment, detention, deportation, and arrest. Don’t miss out on lost opportunities related to business, education, medical emergency and pleasure travel. We fingerprint for a variety of reasons including employment screening, immigration, legal name changes, adoption, licensing, education and more. We are proud to be one of Canada’s longest running fingerprint agencies. The Canadian Legal Resource Centre Inc. is an RCMP accredited and certified fingerprint agency. Go to the Fingerprint Tab and download your free $5.00 off coupon. It’s already bad enough that you have to go through a divorce or separation. We help by offering a collaborative process that reduces your legal fees and conflict. Go to the Separation Agreement tab and own load your free Guide to a Friendly Separation and Divorce. You’ll find answers to commonly asked questions, tips and links to free resources. An interactive website, live communication, great service, attention to detail, friendly qualified staff. 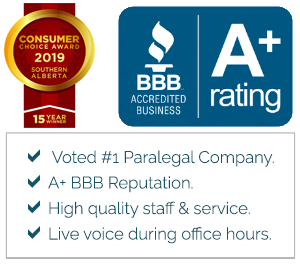 These are just a few of the reasons why clients like you have voted us the #1 paralegal company for each of the past 12 years. Thank you for choosing us and helping us win the Consumer Choice Award for Business Excellence in the category of paralegal services.